Financial assistance for cancer patients through Living Benefit Loan program! Cancer! As difficult emotionally, mentally and, of course, physically as the diagnosis of cancer is, the financial stress if HUGE! At a time when one needs to be as stress free as possible, the lack of financial resources for treatment and living expenses is often overwhelming. That’s where the Living Benefit Loan Program comes in. Life Credit Company is a licensed consumer lender that provides financial assistance and peace of mind solutions to the cancer community. In December, 2012, they introduced the Living Benefit Loan Program and since that time they have been able to deliver over 15 million dollars to countless individuals suffering from cancer. There are nearly 4.1 million cancer patients in the U.S. that are suffering financially that they can help through their Living Benefit Loan program. Most of us have existing life insurance policies; but those policies pay out benefits upon our death. What if you could tap into 50% of those funds now when you need them most? That is what the Living Benefit Loan Program was set up to do. The best part is that they not only help you to quickly receive the financial help you need today, but you will not be required to make any loan payments or incur any out-of-pocket expenses. The loan will be repaid from the policy’s death benefit proceeds upon your death. They even cover the policy’s future premium payments. Any remaining funds will go to your beneficiaries. There are also no restrictions put on the way you choose to use the funds you receive today. Watch this video to learn more about the program! Does the Living Benefit Loan Program Really Work? Advertisements of programs always seem like answers that are too good to be true, but do they really work in the real world? 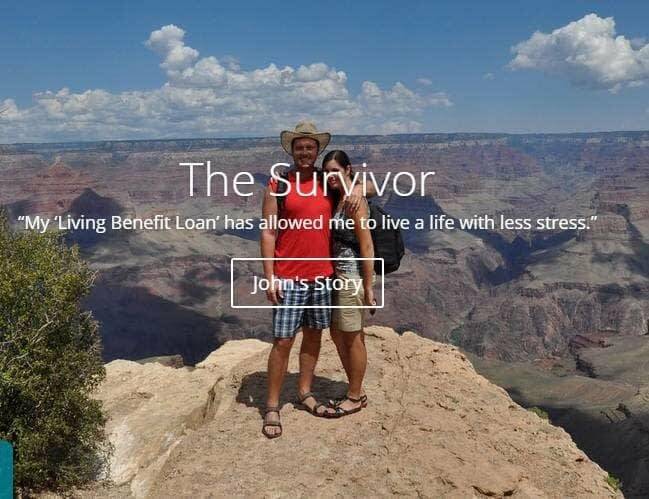 To know if the Living Benefit Loan Program delivers what it professes to, you will want to know what live cancer sufferers have to say about their experience with the program. If you will follow this link, you can hear for yourself what several of their clients have to say in Testimonials. While you are there, you will want to download their FREE Guide to Living Benefit Loans. If you still have further questions about their program, you can contact them here. They look forward to hearing from you and assisting you through their Living Benefit Loan Program.